Upgrading the kitchen? 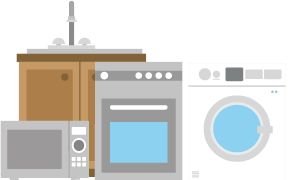 If you’re swapping that tired old dishwasher for a shiny new one with flashing lights and mysterious buttons, you’re going to need a skip to get the old one disposed of properly. The important thing to think about when refurbishing the kitchen is the variety of waste that’s going to be produced. It’s unlikely that there’s going to be any really heavy waste in there, so staying within your skip’s weight limits shouldn’t be a major concern. Wood, copper pipe, M.D.F, tiles and ceramics can all be broken up into smaller pieces and aren’t going to take up too much room in your skip, but it’s those old appliances that you need to bare in mind. Kitchen appliances tend to be big, bulky items and can’t be broken down, so you’ll need a skip with a plentiful capacity to accommodate them all. For the average kitchen refurbishment, we’d recommend either a 6-yard or an 8-yard skip. If you’re not 100% sure that all of your waste will fit into a smaller space, the 8-yard skip is probably the safest bet. Fridges and freezers contain refrigerant gas and have a number of strict regulations on proper, environmentally-friendly disposal, so there’s a £40 charge per fridge or freezer unit. Plasterboard isn’t a problem, but it will need to be placed in a separate bag and left on top of the skip for collection. If you’re worried about sorting your waste out properly, you can always book our assisted waste removal service, in which case some of our friendly staff will help you out throughout the whole process, giving you professional advice every step of the way. We’re helpful like that. Why not give us a call today?